Your contract will be with Hidden Trails Ltd. These booking conditions form the sole contract between Hidden Trails Ltd. and the person signing the reservation form the “Traveler” (who must be over the age of 18) and shall be deemed to sign this form on behalf of all persons named therein. The person signing the booking form (which incorporates these booking conditions) warrants that he/she and all such persons are fully aware of and accept these conditions. If clients book by telephone, internet or fax they will be deemed to have read the booking conditions and are in agreement with them. This contract is subject to Canadian law with British Columbia Courts having exclusive jurisdiction. By making a reservation with Hidden Trails either by fax, mail or internet submission, you accept the Hidden Trails Booking Conditions and enter into a legally binding commitment. Once we receive your reservation, we will confirm availability and if available charge the pending payment to your credit card. Only once we have secured the deposit, will your reservation be confirmed to you in writing (e-mail). Your actual participation in the trip is not confirmed until Hidden Trails Ltd. has received all the signed booking and liability release forms. A deposit of 25% of the total balance (50% for group bookings of 6+) with a minimum of US$ 350 per person is due at the time of booking (higher deposits are required for certain trips). The final balance is due 70 days prior to the departure date. If the booking is made within 70 days of departure the full amount is required at the time of booking. No deposit will be charged if we cannot confirm your trip. A full refund will be made in case we have to cancel your trip for any reason. If you make your reservation less than 5 days before the travel date, there is a 5% supplemental fee to offset our additional expenses. Many of our trips offer discounted rates for groups. In order to qualify for these discounts, we will need one group leader to make the reservation for the whole group - individual reservations will not qualify regardless of total number of participants. Payments (deposit and final payment) should also be made with either one credit card, check or bank transfer. Once we have confirmed your trip (not at the time of submitting your reservation), we will process the payment due to your credit card. The deposit will be treated as part payment of the total amount due. If your reservation is made less than 70 days out, full payment is due at time of confirmation. After we have processed or received the deposit, you will receive a Final Invoice showing the total cost of your vacation and the balance owing. Hidden Trails will automatically process the final balance when it is due (70 days prior to arrival) on your submitted credit card, unless you instruct us otherwise in due time. If the balance is not paid/ received 70 days prior to the date of departure, Hidden Trails Ltd. shall have the right to cancel the booking without further notice, and cancellation charges as set out below will apply. If cancellation falls within the terms of an insurance policy you may be able to claim for cancellation charges, therefore we highly recommend to purchase trip cancellation insurance. Insurance premiums will not be refundable. If after acceptance of the booking you wish to alter the confirmed arrangements a minimum fee of US $75 per person for each change may be charged if such change is possible. If the alteration is less than 90 days prior to departure the cancellation charges shown above may be applied. Any changes to the original booking will not be effective until it is received and agreed in writing by Hidden Trails Ltd. Any additional costs imposed by our suppliers may also be charged. Should Hidden Trails Ltd. have to alter your arrangements after departure, we will make every effort to make suitable alternative arrangements. Where those arrangements are less expensive, you will be refunded the difference. Where they are more expensive, Hidden Trails Ltd. will bear the cost. Compensation payments do not apply where our contract with you cannot be carried out because of unusual and unforeseeable circumstances beyond the control of Hidden Trails Ltd. or its suppliers, the consequences of which could not have been avoided even with the exercise of all due care. Examples include war, threat of war, riot, civil strife, industrial dispute, terrorist activity, natural or nuclear disaster, fire or adverse weather conditions, technical or maintenance problems with transport, changes imposed by rescheduling or cancellation of flights by an airline, the alteration of the airline or aircraft type or other similar events beyond the control of Hidden Trails Ltd.
Hidden Trails Ltd. acts only as agent on behalf of you, the Traveler, in order to obtain accommodations, transportation or other services. The tour may be canceled at any time, even after you, the Traveler, have departed the USA or Canada, for reasons beyond the control of Hidden Trails Ltd. Hidden Trails shall have no responsibility for any such cancellation, except to refund that which has been paid to Hidden Trails Ltd. by you, the Traveler. Hidden Trails shall have no responsibility to you, the Traveler, for any inability to complete the tour by reason of travel restrictions, travel delays, quarantines, medical or customs regulations, delays or cancellations of or changes in itinerary or schedules of carriers, or injury to or inability of Traveler. Hidden Trails Ltd. reserves the right to cancel, without any obligation to refund, make alternative arrangements, or pay compensation, where the customer fails to make payment (see “Payment of the balance”) or otherwise the customer’s behavior brings the vacation to an end. Hidden Trails can only process US$ funds on your credit card. We do accept Can$ and US$ checks. We can also bill you in Euros for trips that are based on the Euro - only to be paid via bank transfer to our Euro account in Germany. US$ prices for trips outside the USA are based on the foreign currency amount for that country. The set US$ rates are subject to change due to currency fluctuations. The trip cost in the foreign currency is listed on our website and will be shown on your invoice. If your trip is based on a foreign currency (other than US$) we will adjust your invoice, at time of final payment, according to the current exchange rate of that day - as given to us by our exchange broker. Rates may also be adjust due to reasons beyond our control - i.e. transportation costs etc. In the event that you have a complaint about any of the vacation arrangements, you must tell the local suppliers at the time, or call Hidden Trails Ltd. (we will accept reverse charge calls, but may not be available on weekends) in order that we are given the opportunity to rectify the matter during your vacation. Failure to complain at the time or to us in this manner will result in the customer’s ability to claim compensation from Hidden Trails Ltd. as it will be extinguished or at least reduced. In any event, any complaint about the trip must be made in writing to us not later than 28 days following the completion of the vacation. 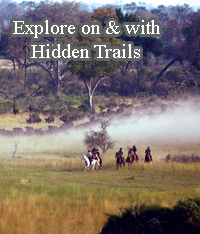 Riding horses and other adventure trips like those offered by Hidden Trails Ltd. is at all times a dangerous sport. Accidents can and do occur occasionally. Therefore, Hidden Trails Ltd. insists that you carry your own health, accident, emergency evacuation and liability insurance or agree in writing to assume responsibility for any injuries. Travel insurance is mandatory for all clients and clients are responsible for arranging their own insurance. Clients are responsible for ensuring that they are in possession of travel insurance with protection for the full duration of the vacation in respect of medical expenses, injury, death, repatriation, as well as cancellation and curtailment. Clients making their arrangements must ensure that there are no exclusion clauses limiting protection for the type of activities included in their vacation. Clients should be certain that any travel insurance arrangements, made through any agency or individuals, are sufficient for their requirements and should arrange supplementary insurance if necessary. If Hidden Trails makes the insurance arrangements for you initially, it is still your responsibility to check with the insurance company that you are adequately insured for the right time and amount. Hidden Trails only initiates the insurance and is in no way involved in the following contract. Hidden Trails Ltd. does not carry liability insurance and cannot assume any responsibility for accidents whether caused by your fault, the horse, equipment, guide, or other persons on the trip. You ride and travel at your own risk. For most trips you will receive a “waiver of liability form” at the time of your booking (see Riding Tour Agreement on right hand page). Please be sure to read it carefully, sign it, and return it to Hidden Trails Ltd. no later than at the time of final payment. You may not start these rides or other trips unless this form has been returned to us. Changes may not be made to the liability form unless you receive prior authorization from us in writing. Hidden Trails Ltd. assumes no responsibility for actions or omissions by carriers, organizers, hotels, etc. Hidden Trails Ltd. assumes no responsibility for actions or omissions by any contractor or other persons. The Traveler agrees that Hidden Trails Ltd. in any case shall not be liable or responsible for death, personal injury, loss or damage of any nature to the Traveler or any personal property or baggage of the Traveler, or for any cause that directly or indirectly relates to the tour, including transportation arrangements to and from the tour, for any reason or cause whatsoever. By making a reservation with Hidden Trails, the Traveler agrees to all the terms of the Hidden Trails “Recreational Activity Release andIndemnity Agreement”. The traveler agrees to forward a signed copy of this release to Hidden Trails eight weeks before starting the trip. Failing to do so may result in cancellation. You must make separate arrangements for travel to and from the starting point of the tour. You must carry with you a valid passport, the necessary visa and vaccination papers. Any information from Hidden Trails regarding visas etc., are guidelines only. The traveler is responsible for all necessary visa, vaccinations and legal documentations. The Traveler(s) must disclose accurate information on their riding ability with their reservation. The Trek Master has full authority to exclude a rider from the trip for inability to ride according to the riding level indicated for the tour or behavior which endangers the other riders or horses. No refunds will be made under these circumstances. Although Hidden Trails Ltd will endeavour to forward any reasonable requests on to the relevant supplier, we regret we cannot promise that any request will be complied with unless we have specificallyconfirme this in writing. Confirmatio that a special request has been noted or passed onto a supplier or the inclusion of the special request on your confirmatio or any other documentation is not confirmatio that the request will be met. Unless and until specificall confirmed all special requests are subject to availability. Hidden Trails may wish to use photographs or film taken during your holiday with Hidden Trails to promote the trip on our website orpublications. If you are opposed to this, please let us know at time of booking or before starting your trip.